Dr. Ohrui designed 4’-C-substituted-2’-deoxynucleoside as the anti-HIV active modified nucleoside which could prevent the emergence of resistant HIV variants. He also proposed the way to reduce the toxicity of modified nucleosides. 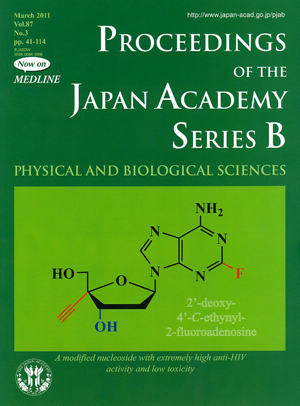 Subsequent studies have successfully proved the validity of the hypotheses and resulted in the development of 2’-deoxy-4’-C-ethynyl-2-fluoroadenosine having extremely high activity against all HIVs and low toxicity. The 4’-C-ethynyl group has special affinity to reverse transcriptase and makes the 3’-OH into a very unreactive neopentyl type secondary alcohol. Thus, the 3’-OH can be used for the recognition but cannot be used for the chain elongation of DNA. The 2-fluoro group makes adenosine derivative stable to adenosine deaminase. The two site (2- and 4’-positions) modifications decrease the toxicity of the modified nucleoside. He also found that the substrate selectivity is different between viral nucleic acid polymerases and human nucleic acid polymerases. Moreover, he has proposed a general structure of modified nucleoside expected to have high antiviral activity and low toxicity. Dr. Ohrui’s studies will extend a new paradigm in the development of antiviral drugs.